A Squire is a knight in training. These young men hail from the County of Edessa, their task being to learn the military arts and see to their Knightly Lord's needs. A squire's equipment depends on what his Lord can afford. 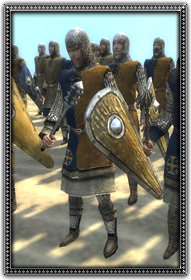 Light amour a, shield and a mace are the most common equipment of the average squire in Outremer.